Peoples' Democratic Party (HDP) Co-Chair Selahattin Demirtaş vowed Friday that he will resign from his post if the government finds evidence of the party's affiliation with the PKK terrorist organization. The remarks came after a member of the pro-PKK Democratic Regions Party (DBP) Metropolitan Mayor Gültan Kışanak was detained along with co-mayor and fellow DBP member Fırat Anlı in an ongoing terror investigation. 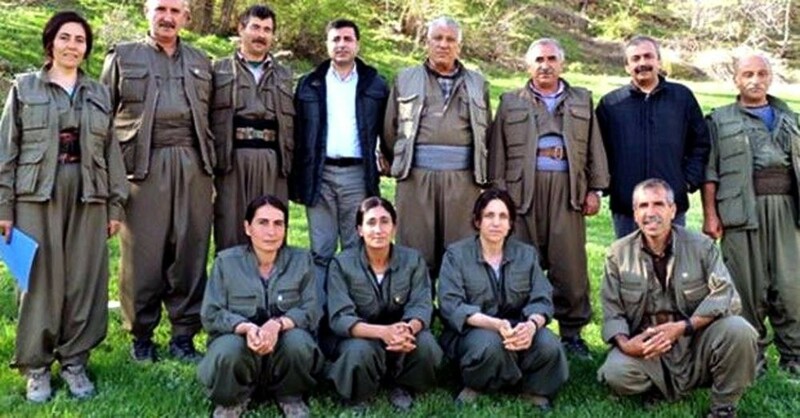 Selahattin Demirtaş posed with the senior PKK leadership in 2013 in Qandil Mountain. Regarding an official report by Turkey's Justice Ministry published in September which revealed at length the involvement of DBP municipalities in various crimes as well as the involvement of the HDP's Diyarbakır branch, Demirtaş said: "If you can prove that even a single cent went from the municipalities to the mountains [Qandil Mountains and the terrorists' headquarters] or the PKK then prove it. Not only Kışanak or Anlı: We will all resign." Commenting on Parliament's justice committee by calling it the Justice and Development Party's (AK Party) committee, while in reality includes members from all four parties, Demirtaş said, "We do not have to accept the AK Party committee putting us on trial." 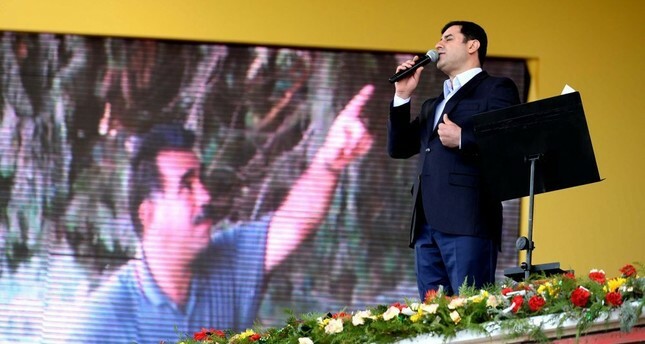 While there is concrete evidence of these municipalities' affiliation with and support for the PKK, the pledge of the HDP co-chairman to resign following the detaining of Kışanak and Anlı now raises questions about his resignation since a report obtained by Daily Sabah columnist Yahya Bostan obtained revealed that the authorities clearly documented financial ties between the PKK and several dozen municipalities, with the vast majority of revenue streams coming from the central government. Addressing the issue, Turkey's Environment and Urban Planning Minister Mehmet Özhaseki stated early last week on CNN Türk that the HDP municipalities have given the funding provided by the government for the rebuilding of Turkey's southeast to temporary workers, which was then transferred to PKK terrorists via those short-term temporary workers. Furthermore, the government's official reports revealed that of the 400 workers hired by the local municipality in Batman, a predominantly Kurdish city in the southeast, 328 allegedly had ties to the terrorist PKK organization. In October 2014, a vehicle owned by the Silopi municipality crashed into an armored vehicle, before the armored vehicle was attacked with 15 Molotov cocktails and assault rifles. On Jan. 4, police followed up on a tip and searched a trailer towed by a municipal tractor in Dargeçit district of Mardin province, seizing seven rocket launchers, 10 automatic rifles, seven hand grenades, 24 anti-tank rockets, 19 RPG rockets, cartridges, radios and backpacks. Despite Demirtaş's confident and rather daring remarks vowing to resign in the said circumstances, the list of HDP municipalities with terror affiliations continues to grow. In fact, just before July 15 coup attempt conducted by Gülenist Terror Group (FETÖ), the PKK conducted a suicide bomb attack with a truck belonging to the Mazıdağı Municipality in southeastern Mardin province – bearing the official license plate number 47 AS 012 – against the Cevizlik Gendarmerie Post in Artuklu district on July 9, 2016 that resulted in the deaths of two soldiers and one civilian and left 24 soldiers as well as 14 civilians injured. Government reports have revealed that the car bomb attack by PKK terrorists conducted shortly after the coup attempt on Aug. 26 which left 11 police officers dead and at least 78 people injured, was launched using a car that belonged to the HDP's Cizre Municipality. A total of 15 people were arrested in connection with the attack, including three officials from Mardin Metropolitan and Mazıdağı municipalities. The municipalities further used their PKK ties to extort money from local businessmen where a lawsuit was filed in one case in which officials from the Erciş Municipality in eastern Van province asked for TL 500,000 ($167,000) on behalf of the PKK to issue a license for a local hotel owner's application. In another case of extortion in Diyarbakır's Sur province, a local complained to the police and said that the municipality officials asked for TL 70,000 to issue a license, showing a list of people who have given some TL 150,000-to-TL 250,000 to obtain licenses.